Manila is keen on moving ahead with its plans – with or without a major bilateral pact. Amidst the tensions generated by China’s development of artificial islands in the South China Sea, Philippine Secretary of National Defense Voltaire Gazmin reiterated the Armed Forces of the Philippines’ (AFP) plan to rehabilitate the air and naval facilities in Subic Bay Freeport in the central part of the mainland island of Luzon. Subic Bay, a deep water harbor located fifty 50 miles northwest of Manila facing the South China Sea, was the service and logistic center for the U.S. Seventh Fleet until November 1992. Accordingly, this move will enable the AFP to quickly deploy its fighter planes and frigates to any contingency in the South China Sea in the face of China’s maritime expansion in these disputed waters. Since 2011, the Philippines has rushed to build up the AFP’s credible defense posture. The Philippine Navy (PN) bought two Hamilton-class U.S. Coast Guard Cutters, and transformed these ships into surface combatants by equipping them with several automatic guns and attack helicopters. The Philippine Air Force (PAF) is set to acquire 12 FA-50 fighter planes from South Korea with the first two jets to be delivered later this year. The AFP intends to station these air and naval assets in Subic Bay which will become the Philippine military’s forward operating base given its proximity to Scarborough Shoal, which China occupied in June 2012. The Philippine Department of Defense (DND) will spend Php100 million (estimated $2 million) to upgrade some of the former U.S. military facilities of Subic Bay. The Philippine government announced that the rehabilitation of these facilities will happen soon, and it will be focused on the old airport facilities in the former Cubi Point Naval Air Station (CUBINAS). Prior to 1992, CUBINAS served as a base for the U.S. Navy’s P-3 Orion anti-submarine warfare aircraft during the Cold War. The PAF will be allotted a 13-hectare portion of the old naval air base where shipping giant Federal Express (FEDEX) used to operate. Along with the air station, a portion of the free port will also be developed as a naval base for PN ships. The free port’s Ship Repair Facility compound will be the homeport of the PN’s latest acquisitions—the BRP Ramon Alacaraz (PF-16) and the BRP Gregorio Del Pilar (PF-15). Other port facilities such as Alava Pier, Juliet Pier, Bravo Wharf and Rivera Wharf will also be developed as part of the PN’s new naval base. The Philippine government’s plan to develop Subic Bay as a military facility was first announced in October 2012, four months after the Chinese occupation of Scarborough Shoal. 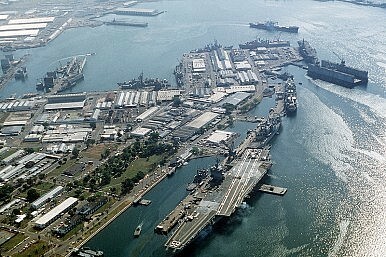 When it was announced, Philippine and U.S. officials confirmed that Subic Bay–once the U.S. 7th Fleet homeport and the primary staging area for all American naval activities in the Southeast Asian waters–as a Philippine military facility that will host U.S. forces on a semi-permanent rotational presence. These U.S. forces will engage the AFP in regular joint exercises to develop the latter’s doctrine and equipment in territorial defense, and enhance the two allies’ interoperability. There were also plans to preposition U.S. logistics assets in the Subic Bay, and utilize some of the port facilities to service U.S. Navy ships. Earlier in April 2012, America’s largest military shipbuilding company, Huntington Ingalls Industries (HII) subsidiary AMSEC signed an agreement with South Korean Shipbuilding Company Hanjin Heavy Industries and Constructions to provide maintenance, repair, and logistics for U.S. Navy ships using Hanjin’s dry docks in Subic Bay. On 28 April 2014, Philippine Defense Secretary Gazmin and U.S. Ambassador to the Philippines Philip Goldberg signed the Enhanced Defense Cooperation Agreement (EDCA). This executive agreement provides the framework by which the Philippines and the U.S. can develop their individual and collective (defense) capabilities. Such task can be accomplished through the rotational deployment of American forces in Philippine bases. Although the EDCA allows American forces to utilize AFP-owned and -controlled facilities, the Philippine base commander has unhampered access to these locations. Likewise, American built or improved infrastructure inside these installations can be used by the AFP. Furthermore, any construction and other activities within in the Philippine bases require the consent of the host country through the Mutual Defense Board (MDB) and Security Engagement Board (SEB). Through the EDCA, U.S. forces are afforded two innovative access arrangements in the Philippines, namely: a) forward operating sites – expandable military facilities with limited U.S. military support presence; and b) cooperative security locations – facilities with little or no permanent American presence and maintained by the host-nation. These are less expensive, less visible and less vulnerable access arrangements that offer greater strategic and operational flexibility. Unfortunately, left-wing groups and ultra-nationalist personalities questioned EDCA’s constitutionality as an executive agreement requiring no concurrence from the Philippine Senate. EDCA is currently in a legal limbo as both sides wait for a decision from the Philippine Supreme Court before the agreement can be implemented. However, confronted by Chinese island building activities in the South China Sea, the Philippine government decided to push through with the development of Subic Bay as a training and forward launching facility for U.S. forces operated by the AFP. Secretary Gazmin admitted that U.S. military (rotational) presence in the AFP military facilities would help. However, if the court decides against EDCA, the Philippine government will still proceed to develop these facilities inside Subic Bay Freeport. The U.S. Navy has adopted the Philippine government’s pragmatic position of utilizing Subic Bay with or without EDCA. Since mid-2015, several U.S. Navy ships have docked in this former naval facility. In early May, the U.S. Navy’s newest littoral combat ship the U.S.S. Fort Worth (LCS-3) made a brief refueling and resupply stop at Subic Bay. Before the month ended, the Ticonderoga-class-guided-missile cruiser U.S.S. Shiloh (CG-67) arrived in Subic Bay for a port visit. In July, the Arleigh Burke-class guided missile destroyer U.S.S. Lassen (DDG-82) dropped anchor at the former U.S. naval base for a routine port call. Early this month, the Los Angeles-class attack submarine U.S.S. Chicago (SSN-721) docked in Subic Bay for its first visit to the Philippines. With or without EDCA, both the AFP and the U.S. Navy are exerting their own respective efforts to make Subic Bay again a major staging base for U.S. power projection in the South China Sea. Dr. Renato Cruz De Castro is a professor in the International Studies Department, De La Salle University, Manila, and the holder of the Charles Lui Chi Keung Professorial Chair in China Studies. He was the U.S. State Department ASEAN Research Fellow from the Philippines. Washington touts "stabilizing force" of its presence as Manila and Beijing trade barbs.